As I prepare for my expedition to the Indies, I wanted to write about my life so far so that when I return triumphantly, everyone shall remember my greatness! My name is Cristoforo Colombo, but most people know me as Christopher Columbus. I was born in Genoa, Italy in 1451, the oldest of five children. I was an obedient son. I had little schooling, so I did not learn to read or write as a young boy. But I always loved the sea. I vowed as a young boy that as soon as I was old enough, I would go to sea. I traveled to Greece and Portugal, and I became a sailor in my early teens. In 1476, I was a crewman on a ship that was attacked by French pirates. I was lucky and found a piece of what was left of the ship. Fortunately, I was able to swim the six miles to shore. I traveled to Lisbon, Portugal where my brother, Bartholomew, owned a book and map store. I read many of the books and studied the maps until I had taught myself all I could learn about navigation and mapmaking. Starting in 1484, I tried to convince King John of Portugal to pay for supplies, ships, and a crew to make the voyage to Marco Polo’s amazing gold mine. He refused to pay for my voyage saying that I would fail. At least he knew the world isn’t flat like so many others. He just thought the world is much larger than I do. [Editor’s note: King John was correct, Columbus thought the world was much smaller than it really was.] I decided to ask King Ferdinand and Queen Isabella of Spain to pay for my voyage instead. It took me a couple of tries, but they agreed to supply me with the things I needed. Let the Portuguese sail all the way around Africa and across the Indian Ocean. That is the long way to go! The Portuguese king will regret not paying for my voyage! The rulers of Spain gave me three ships—the Niña, the Pinta, and the Santa Maria. They also paid for 90 crewmen and supplies. This is killing me! Where is land? We have sailed for days and days, and there has been no sight of land. We have had clear skies and steady winds, but my crew is angry and fighting. There is even talk of turning back. The crew has even threatened to push me overboard and sail back to Spain. I am not letting that happen. I have gone too far to turn back now. Land must be near, I know. Crewmen have spotted branches in the waters and birds that could not possibly go very far from land. From these signs I am sure land is near. I am growing impatient. There are more signs, but no land. According to my calculations, we should have spotted land many days ago. I have decided to offer a reward for any sailor that spots land. I only hope that the reward will buy me a few more days before the crew revolts. I spotted several of them wearing GOLD! They tell me that islands to the north and south are where the gold will be found, so I ordered my men to set sail for the gold! We searched many different islands, but we found only more Indians. There were no cities and no gold. We traveled north to a much larger island, but still more Indians and no gold. The King and Queen will not be happy if I do not find gold! As we prepared to return to Spain, the Santa Maria ran into a coral reef. It tore holes in the bottom of the ship. We were forced to build a fort out of the wreckage of the Santa Maria. With only two ships, we could not take everyone back to Spain with us, so I found 40 volunteers to stay behind to build a small colony. We sailed back across the Ocean Sea. Despite terrible storms, my navigation skills have brought us back to Spain. I have received a letter from the king and queen. They have named me Admiral of the Ocean Sea and the governor of all of the islands that I discovered. News of my discoveries has traveled across Europe. My voyage is known by all, and I am a hero! I would like to see the look on King John of Portugal’s face! I bet he regrets not paying for my voyage now. I am anxious to return to the land that I discovered because I still have not found the gold that I know is there. I have spent the last year on my second voyage across the Ocean Sea. Sadly, I found the fort and the men that I left behind from the first voyage dead. I do not know what happened to them. I built a new village on another island. My men found gold on this island! I sent a load of gold back to Spain. The Indians were not as friendly this time, and I was forced to kill many of them. I still have not found the great cities that Marco Polo described. The king and queen are ungrateful! They have thrown me in jail because the men in the new colony complain that I am not a good governor. How dare them! I have now sailed across the Ocean Sea three times. I have claimed many islands for Spain, and this is how they treat me? The king and queen realized their mistake and freed me from jail. They even paid for another voyage across the Ocean Sea. Unfortunately, my ships leaked so badly that I was stranded for an entire year on an island I called Jamaica. I have decided that my explorations have come to an end. The king and queen refuse to pay for a fifth voyage. At least I can retire a hero! Christopher Columbus was an Italian who sailed under the Spanish Flag. He persevered in his quest to obtain backing for an expedition to sail a small fleet of ships to search for a sea route to the Indies. In 1492 King Ferdinand and Queen Isabella of Spain finally give Christopher Columbus the money and ships for his expedition. The names of the 1497 Christopher Columbus Ships were the Nina, the Pinta and the Santa Maria. The brave men of the 1400’s and 1500’s, like Christopher Columbus, who sailed in uncharted waters to unknown lands were courageous adventurers who were motivated by fame, glory and the wealth. The living conditions on board the small ships were basic and the voyages were dangerous. Who did Christopher Columbus name his ships for? Who did Christopher Columbus name his ships for? His own flagship, the Santa Maria was fitted out in a place called El Puerto de Santa Maria. El Puerto de Santa Maria is located on the Guadalete River outlet, in the Bay of Cadiz. During the 16th and 17th centuries, El Puerto was the winter headquarters and base for the Royal Galleys of Spain. The Santa Maria was named after this location in Spain. The Pinta means the “Painted One” and was probably a nickname given to the ship. The Nina means “Girl” but was originally called the Santa Clara. Her nickname ‘Nina’ probably derives from her master, Juan Niño. All of the navigational aids used by Christopher Columbus on the Nina, the Pinta and the Santa Maria were used to measure the angle between objects above the ocean, such as the stars or the sun, with the horizon. This would have enabled Christopher Columbus to calculate the ship’s position at sea. Facts, Information and history about the three Christopher Columbus Ships. What do you mean a terrific Failure? How can you be terrific, which means great? And A Failure, which definitely does not mean great? Well that is what Chris was. A Terrific Failure! He is terrific because he dares to think Different, when everyone is sailing east to get to Asia or The Indies as they were called then. 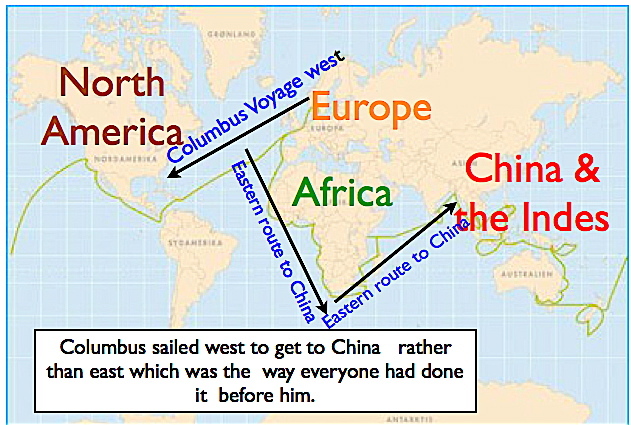 So Columbus is terrific because He sails west. He has courage, bravery and most of all thinks for him self. And another thing that is terrific is he never gives up. Talk about stubborn! He starts asking for ships to make his trip to the east by sailing west in 1484. He asks again and again and again. But everyone thought he was crazy no one had ever sailed west, and no one would give him money for this trip. They were afraid they ships would just get lost in the big ocean and they would lose all their money. He hears no no no no no no no no no no no, and finally Queen Isabella of Spain says yes. 8 years of no for 1 yes, now that is what I call persistence. Ok he is terrific but how is a terrific failure. Well what was his goal? That is easy to find a short western route to Asia! his main goal to reach asia by sailing west! he failed! And what is even more of a Failure , he never knew it! What ? that’s right he thought That San Salvador was an Island off Japan, and that Cuba was China. He made four trips back and never learned the truth! He always thought he reached Asia, which is why he called the people there Indians, he thought he was in the Indies. The journey is the goal? well we could compare Columbus to a great basketball player in high school, I mean a kid that plays constantly, and wants to play in the NBA so he gets a scholarship to go college to play ball, but he break his ankle and never makes it to the NBA, however while in college he studies medicine, becomes a scientist and finds a cure for cancer. Saves millions of lives and gets the Nobel Prize in Science! Just like Christopher Columbus a terrific failure! Think about it the journey is the goal, maybe you to could be a terrific failure! NEW YORK – They were co-pilots when Christopher Columbus sailed to the Americas in 1492, but unlike Columbus, they are not celebrated with a national holiday in the United States – at least not yet. Two descendants of the brothers Martin and Vicente Pinzon say it is about time the pilots of the Nina and the Pinta -two of the three ships that were part of Columbus’ expedition – got equal recognition with Columbus. So why not celebrate Pinzon Day? The Pinzons were brothers from a family of Spanish shipowners who sailed with Columbus, who was on the Santa Maria, on his first voyage. But while Columbus is remembered for informing Spain of his discovery of the New World, Martin Pinzon, the pilot of the Pinta, is known for breaking away from the expedition near Cuba to search for gold and spices. He tried to beat Columbus back to Spain to gain recognition for finding the New World but arrived too late. His brother, Vicente, piloted the Nina, and remained with Columbus throughout the expedition. So what do you think should Martin Pinzon have his own day? A bulb is an underground, modified stem that develops in some flowering plants. Its purpose is to store food and water for the plant through a cold or dry season. Examples of bulbs include the tulip, narcissus, crocus, onion, lily, and garlic. The smallest bulbs are the size of peas; the largest (crinum lilies) weigh over 15 pounds (7 kg). In plants with bulbs, an underground storage bulb develops during the growing season; the upper part of the plant dies as the weather becomes cold or dry. The bulb remains dormant (living but inactive) underground until the weather warms and water is available. At the start of the new growing season, roots grow from the bottom of the bulb and a bud grows from the stem. The food and water in the bulb tissues nourish the fast-growing bud. The bud develops into a plant that will blossom (producing seeds above ground) and then die back (above the ground) at the end of the growing season; this cycle continues year after year. Many bulbs require a period of low-temperature dormancy before they sprout new buds and roots. Bulbs are usually globular and have concentric layers of fleshy leaves covering the short stem. The fleshy leaves store food and water. Roots emerge from the bottom of the bulb at the beginning of the growing season. The bud grows from the apical meristem at the tip of the short stem. Lateral buds (also called bulbels or bulblets) can develop from the base of the existing bulb, producing new, smaller bulbs each year. Christopher Columbus Was Columbus smart about safety? Christopher Columbus Was Columbus smart about safety? Columbus Day always falls on the 2nd Monday in October Nearly everyone knows that “Columbus sailed the ocean blue .. in fourteen hundred ninety two (1492).” The question is – Was Columbus smart about safety? Can you imagine what it would be like to live on a crowded school bus for eight long months? Columbus and his men had a little more room than that, but not much. It was an amazing adventure. He built sturdy ships. It is a matter of record that Columbus carefully planned the construction of his three ships – the Santa Maria, the Pinta, and the Nina. He even ordered “crooked pines” from the Pyrenees to be dragged down to the sea to be used to make the frames, beams, and decks, for extra sturdiness. He had no idea what dangers he would face, but he was sure that one of them might be storms at sea. He protected his maps and charts. Columbus had a small cabin built on the Santa Maria that held his bed, a few personal belongings, and his maps and charts. It was the only cabin on board. He built space below the deck to store ample supplies. The hold – the space below deck – was used to store food, tools, ropes, extra sails, cannon balls, guns, and other supplies Columbus felt they might need on the trip. He ordered the crew to catch fresh fish every day, to avoid illness. The crew caught fresh fish every day they could. Along with fish, they ate salt meat, cheese, beans, rice, almonds, honey and raisins. He told his men that they could not drink the ocean water. Instead, Columbus and his crew drank water from wooden barrels they had brought on board, and wine from big casks. He ordered his men to cook their meals. All meals were cooked in small fireplaces on deck called sandbox cookers, to reduce the risk of illness. Sandbox cookers were designed to allow cooking on deck safely, without catching the wood ship on fire. He had at least one man on watch at all times. At least one member of the crew was always on watch, on the lookout for any danger including pirates, men overboard, reefs, and land. The man on watch was tucked high up on the 80-foot mainsail, in the “crow’s nest.” Everyone arrived safely! Once he set sail, it took Columbus only two months to catch his first sight of the New World. Still, that was a very long time for 90 men to live in a space about the size of a schoolbus. Yet, there is no record of any outbreak of disease. No one fell overboard. When they spotted land, they did not rush in. They must have been glad to spot land for many reasons! Still, they did not land right away. Columbus and his crew sailed along the shoreline. They stopped at a couple of places and established some base camps. They met the natives – some friendly, some not. His careful planning and sturdy ships saved their lives. When Columbus and his men decided to leave the New World and return to Spain, they ran into a little trouble. By then, they were down to only two ships, which made things even more crowded. A storm had wrecked the Santa Maria on Christmas Day that year. (Columbus returned to Spain on the smaller ship, the Nina.) They ran into another storm as they were returning to Spain. They were tossed about by waves higher than a sixty foot building! The Nina and the Pinta were separated in the storm. Yet, both ships safely found their way home. The round trip, including their adventures in the New World, took eight months. Columbus was paid well for his trip. Columbus was highly respected and, thanks to his adventures, he was also quite wealthy. He was happily married. He had a couple of kids. He was incredibly stubborn. To the day he died, he never once admitted that he had found a New World. He insisted that he had, in fact, discovered the back door to China. General Interest 1789 : The First Supreme Court The Judiciary Act of 1789 is passed by Congress and signed by President George Washington, establishing the Supreme Court of the United States as a tribunal made up of six justices who were to serve on the court until death or retirement. 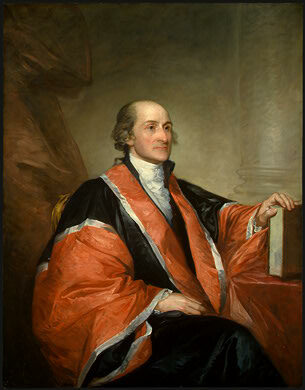 That day, President Washington nominated John Jay to preside as chief justice, and John Rutledge, William Cushing, John Blair, Robert Harrison, and James Wilson to be associate justices. On September 26, all six appointments were confirmed by the U.S. Senate. The U.S. Supreme Court was established by Article 3 of the U.S. Constitution. The Constitution granted the Supreme Court ultimate jurisdiction over all laws, especially those in which their constitutionality was at issue. The high court was also designated to oversee cases concerning treaties of the United States, foreign diplomats, admiralty practice, and maritime jurisdiction. On February 1, 1790, the first session of the U.S. Supreme Court was held in New York City’s Royal Exchange Building. The U.S. Supreme Court grew into the most important judicial body in the world in terms of its central place in the American political order. According to the Constitution, the size of the court is set by Congress, and the number of justices varied during the 19th century before stabilizing in 1869 at nine. In times of constitutional crisis, the nation’s highest court has always played a definitive role in resolving, for better or worse, the great issues of the time. Student Technology Survey 2.0 is for students at all levels and stages of learning. What kinds of technology do you use both in and out of school? What kinds of technology do you want to use, and how? This survey is an updated version of a student technology survey released by the State Education Department in June 2009. The deadline for completing the survey is September 30, 2009.